geoSCOUT - geoLOGIC systems ltd.
geoSCOUT is a powerful visualization, analysis, and forecasting suite for Windows with an extensive library of premium data. Thousands of energy professionals trust geoSCOUT to map oil and gas plays, see trends, understand reservoirs, plan for the future, and make mission-critical decisions. Use our integrated Canada, Montana, and North Dakota data, bring your own data from anywhere in the world, or do both. Superior mapping, charting, and annotation tools make visualizing data easier than ever. Create surface maps and structural geology maps. View assets like wells, pipelines, and land. Compare what you see against satellite imagery. Powerful charting tools turn complex oil and gas data into visualizations like production charts, cross sections, 3D well bore maps, and histograms. Add your professional insights as you go. Whether you just want to add text to a map, digitize contours you created by hand, or create detailed cross sections for your area of interest, geoSCOUT supports you every step of the way. geoSCOUT helps oil and gas professionals from all disciplines make sense of data, whether you care about the small details or an entire basin. With geoSCOUT, engineers can solve complex engineering problems like designing completions and improving production. Geologists can identify productive intervals and understand the stratigraphy in a play. Land professionals can ensure your business acquire the rights it needs to be profitable. Investors can monitor assets and liabilities. Infrastructure planners can overcome obstacles and ensure the right resources are in place. No matter who you are, whether you’re using our data, your own, or a combination of the two, geoSCOUT will help you make the best decisions of your career. If you fail to plan, you plan to fail. Don’t be caught unprepared. Use geoSCOUT to monitor depletion and declines, plan your plays and drilling programs, and anticipate problems so your business thrives in the future. Keep an eye on your competitors to make sure you’re leading the pack and keeping costs low. You can even use geoSCOUT to ensure regulatory compliance and plan for disasters. geoLOGIC is pleased to announce more features released to its flagship product, geoSCOUT, making it easier than ever to organize your results faster and with greater efficiency. "Theme Your Wells, Better Frac Planning, Easier LAS Net Cut Offs"
Use the Listing Report in Data Analytics to arrange your wells, and in just one click, create themed layers for each grouping in the Layer Manager and on the map. It’s so easy to visualize your filtered results in mere seconds! Move well layers out of the default wells group in the Layer Manager. This time saving feature allows you to better manage and organize your saved well layers into your own unique user well groups. Visualize Fracture Planning Zones and identify offset wells while planning new wells or completions programs, so you can evaluate potential risks near an existing well or planned well location. Quickly and easily batch calculate LAS net cut-offs via the map and save the calculated values directly to the user database, which creates an efficient time-saving workflow. To learn more, connect directly with our sales team at sales@geologic.com, 403-262-1992.
geoLOGIC is pleased to announce a new Drilling Module in geoSCOUT v8.9. Visualize drilling time breakdowns, compare multiple wells, access digitized tour report data at a glance and more- all within geoSCOUT.
" Interactive Statistical Charts, Detailed Breakdowns, Plus More "
Drill and complete more efficient wells by determining factors that lead to best composite performance. Determine best-in-class performance by benchmarking competitors, vendors, and drilling attributes. Reduce non-productive time by proactively identifying potential issues. Plan better wells by integrating all relevant data sets. Join geoLOGIC and contribute to this comprehensive database for western Canada, and receive benefits that you won’t want to miss. To learn more, connect directly with our sales team at sales@geologic.com, 403-262-1992.
geoLOGIC is pleased to announce two new modules available in geoSCOUT v8.8: Well Planning and Well Profile Viewer. Make accurate, mission-critical well planning decisions with geoSCOUT’s smart survey design tools.
" Powerful, Interactive, Smart "
Visually design well surveys for new wells or existing wells for re-entry. Compare and contrast prospective surveys to choose the best option. 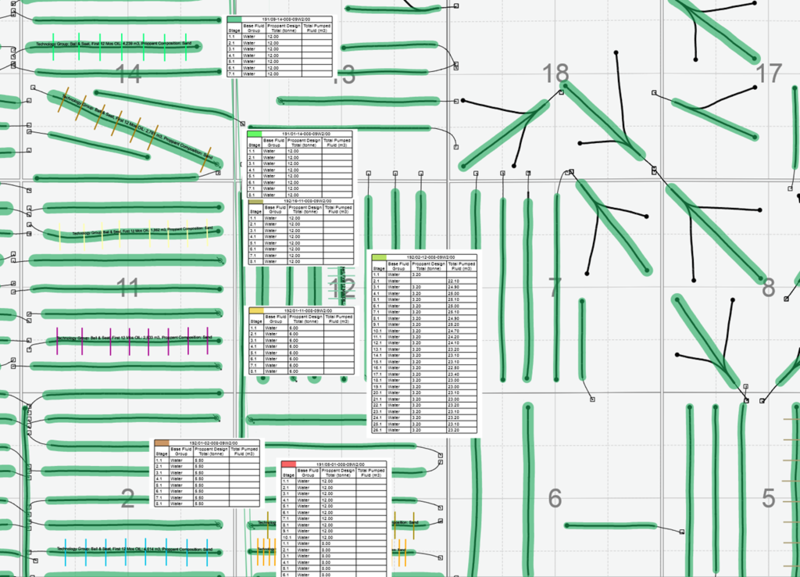 Automatically display horizontal and vertical raster logs and LAS files for a detailed perspective. Make informed decisions by viewing the formations, completions, and more around your prospective surveys. Design a toe-up or toe-down well in seconds, plus much more! Ready to try or purchase geoLOGIC’s newest Well Planning and Well Profile Viewer modules? We are ready to work with you to get these modules in-house today. Connect directly with our sales team at sales@geologic.com, 403-262-1992.
request well profile viewer brochure! 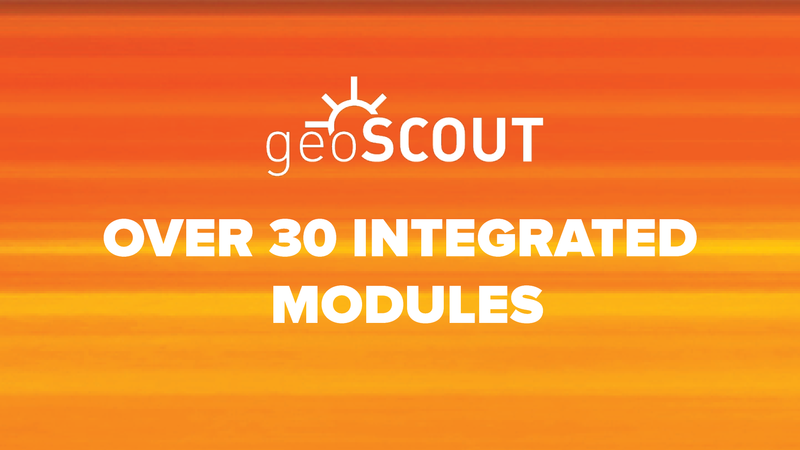 geoSCOUT is modular. You choose the components you need to get the job done. 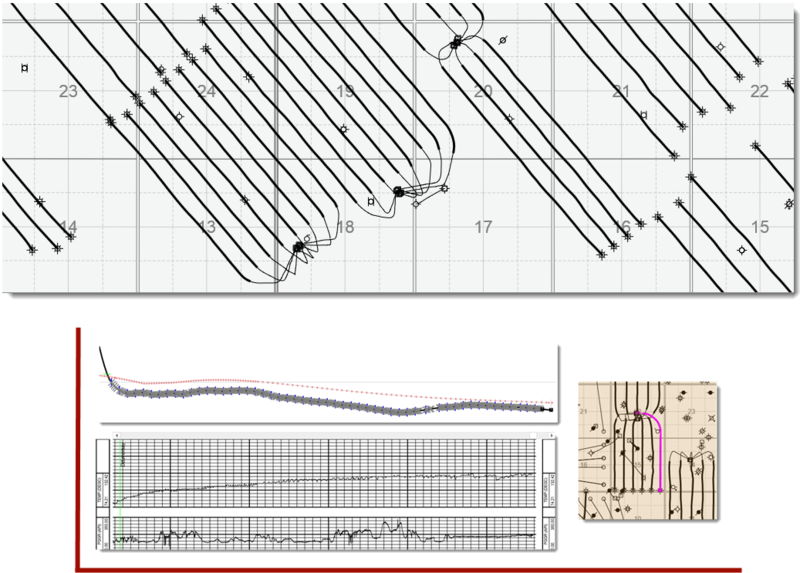 View and annotate stratigraphic diagrams side-by-side. Cross Section helps geologists pick formation tops and make correlations between wells with the help of logs and other tools. Find, manage, and combine LAS-formatted well logs. LAS files are versatile text files that can be used throughout geoSCOUT to correlate formation depths and indicate hydrocarbon quantity and quality. 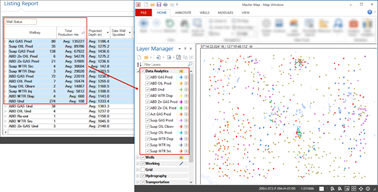 Work with core analysis data for wells with analyzed cores. Core Analysis gives the most accurate insight into porosity, permeability, and other important reservoir characteristics. 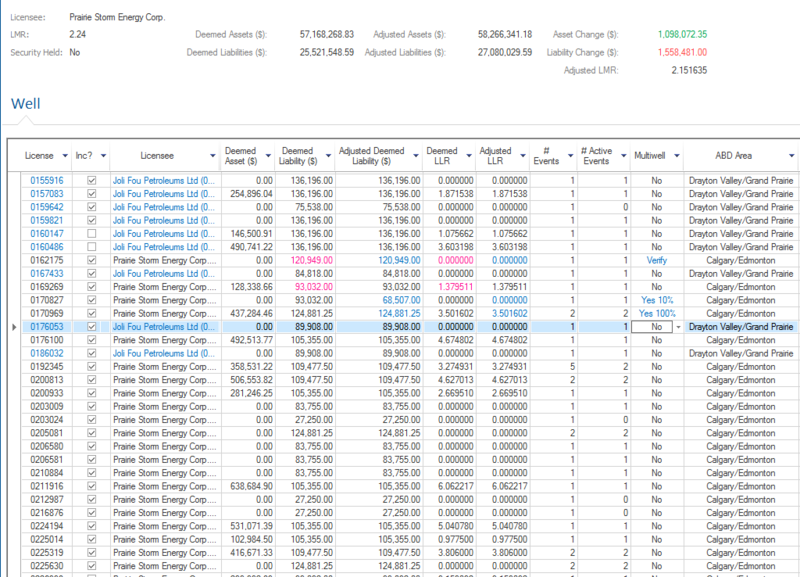 Interactively select, sort, pivot and filter your well, frac, production and pressure data. Drag and drop your data fields of choice and then slice and dice your data in any way you choose. Combine box plots, scatter plots with column, bar, line, area and pie charts on a chart canvas for important presentations. geoSCOUT sources drilling data from participating companies so you can better aggregate and analyze your data. With Drilling, you can access digitized tour report data at a glance, visualize drilling time breakdowns, compare multiple wells, plus much more. Use comprehensive drill stem test data to analyze the hydrodynamic properties of reservoirs and determine hydrocarbon presence. DST Pro provides pressures and flows to help determine fluids, pressure, and permeability at the drill stem. Input LAS, core, test, and perforation data to create petrophysical interpretations. Good interpretations help determine lithology, net-pay, porosity, water saturation, permeability, and more, so petrophysicists can verify hydrocarbon presence and measure its ability to flow through the wellbore. Compare one well against a reference well. twinGRAM helps geologists pick formation tops and make correlations between wells with the help of logs and other tools. Plan prospective wells by pairing Well Profile Viewer with a subscription to Well Planning. Create your own well surveys when you add new wells to geoSCOUT, all in one step. Design a toe-up or toe-down well in seconds. Define heel station depth and build-up rate to control your survey path. Plan your prospective wells exactly as you want to drill them, and see how they would interact with the landscape around them. To learn more, request the Well Planning Module Benefit Sheet. Visualize horizontal well surveys in the context of formations, formation elevation contours, downhole events, completions, and logs. Pick formation tops, import grid files, and view reference surveys to compare wellbores in context. Verify wellbore locations in relation to your zones of interest. Focus on the horizontal section of the well bore with horizontal LAS and raster log data, and compare multiple surveys to choose the best option before drilling. To learn more, request the Well Profile Viewer Module Benefit Sheet. View 3D well bores, detailed survey data, and import your own surveys into geoSCOUT. The Survey Viewer shows exactly where wells have been drilled, providing insight into wellbore locations and interactions. Map and order 2D and 3D seismic line data through the Seismic Data Listing Service. Once you order seismic data, use it to estimate models of the subsurface, which help create volume estimations and map potential hydrocarbon reservoirs. View the entire production and injection history of a well or group of wells. 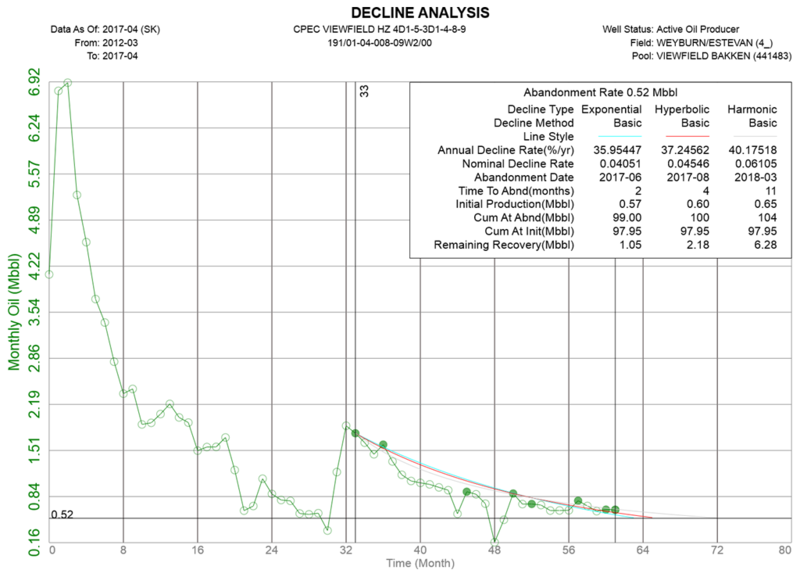 Use the integrated Decline Analysis toolset to forecast future production and ultimate recovery, analyze enhanced oil recovery, predict net revenue interest, and identify production issues/mechanical problems. View analyzed completions and fracturing data at both the well and stage level. Benchmark performance, and define costs and risks associated with your E&P planning, acquisitions, divestitures, and more. View detailed pool-level data and estimate remaining OOIP/OGIP. Reserves uses recent production data to calculate remaining reserves, resulting in up-to-date estimations in jurisdictions where reserves data is not updated. Review oil, gas, and water analyses. High-quality fluid analyses are vital to understand downhole fluids. Geologists and engineers use fluid analysis data when making reservoir correlations, estimating reserves, interpreting well tests, designing completions, and more. View public and proprietary pressure test data for wells and pools. Material balance calculations describe the expansion of oil, gas, water, and rock as a pool depletes, providing accurate insight into OOIP/OGIP, drive mechanism, and expected recovery factor. Estimate the volume of rock that contains hydrocarbons, and calculate original and remaining gas/oil in place. Volumetrics helps you determine in-place hydrocarbons when production and pressure data is not available. In mature pools, combine Volumetrics’ output with Material Balance and Decline Analysis for a more robust understanding. Mine petroleum and engineering data and understand reservoir performance so you can optimize production and ultimate recovery. Analyze material balance utilizing Havlena and Odeh plots. Calculate OOIP versus time, drive indexes versus time and drive versus actual pressure profile. Import production and injection data, create or import pressure profiles and view diagnostic plots identifying reservoir performance and conditions. View and map land and unit agreements. Land provides detailed Crown, Freehold, and First Nations land data, displaying the ownership, trends, and availability needed to make acquisitions or divestitures, manage rights, and support business decisions. Estimate the ownership value of wells, land, and production, and determine the top well and land owners in the project. Ownership Analysis streamlines complicated scenarios with multiple variables and can help evaluate merger and acquisition opportunities. Develop scenarios to forecast your company’s LLR/LMR when evaluating your options for current assets and liabilities, and when acquiring and shedding licenses. View detailed pipeline and facility data and view pipelines and facilities on the map. Use Pipelines and Facilities data to understand and optimize infrastructure, reduce risks, and make acquisitions and divestitures. Import and manage proprietary or third-party land data in geoSCOUT. Use User Land to visualize proprietary and third-party Land data on the map and take advantage of geoSCOUT’s search abilities. Link proprietary data from a spreadsheet, text file, or database to geoSCOUT to map your proprietary data, view that data in geoSCOUT, and take advantage of geoSCOUT’s search abilities. View incidents reported to the Alberta Energy Regulator. Environmental data ranges from odor complaints to fatalities, and is vital for preparing emergency planning zones, emergency response plans, and highlighting histories of problems when taking over leases and wells. 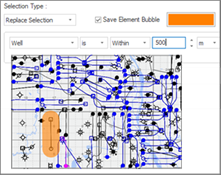 View H2S release rates, maximum H2S concentrations, and gas flow rates for formations in an area. H2S reports are important tools to help evaluate the economic value of gas and how sour gas effects production. Identify the formations that caused drilling difficulty and see how long it took to complete wells. Area Hazard Reports provide details of drilling and completions problems and a spatial representation of hazards in your area of interest. Quickly create detailed reports about the selected wells’ production history, which include extensive calculations and charts that illustrate the wells’ entire production story. Store and view well, facility, and tour report documents. qFind gives access to publicly available documents and manages your proprietary documents, so important original documents are always available. Whether you’re a customer, between jobs, or a student, we offer great training programs at no cost to you. Come to our top-of-the-line training center, learn online, or host us at your office. We have courses for all disciplines, and regularly do custom training. There’s a reason we renamed our support team “Customer Solutions”. Our people are specially trained to actually solve your problems. Whether you’ve found a bug, have a feature request, or just need a hand getting your work done, we’ll make sure you get true solutions at no cost to you. Our products come as an annual subscription. Your subscription includes all enhancements, bug fixes, and data updates at no extra cost. geoLOGIC systems maintains Certified Partner status and Gold competency in the Microsoft Partner Program. This recognizes our expertise with Microsoft technologies, impact in the technology marketplace, and a proven ability to meet customers’ needs. With our huge library of digital well logs, there’s a good chance we already have the digital logs you need. If we don’t, we’ll get them for you at competitive prices. geoLOGIC has been digitizing logs since 1998. We use a sampling rate of 6 inches to digitize logs from the Western Canadian Sedimentary Basin into LAS (Log ASCII Standard) files. Our digitizing times beat industry standards, ensuring the turnaround you need. We have a large well document collection, including tour reports, abstracts, area, coal bed analysis, completion, core analysis and special core analysis, directional survey, drill stem test, drilling, fluid analysis, geological report, miscellaneous, PVT analysis, pressure test, and well license documents. Need something we don’t have? We’ll get it for you confidentially and on-demand. Client/server architectures using Windows-based clients and your choice of networks and servers. Thin-client environments using technologies like Windows Remote Desktop Infrastructure (Terminal Server) or Citrix. Everyone is different. We’ve deployed geoSCOUT in some pretty unique ways. No matter how your systems work, we’ll find a way to get things running. geoSCOUT supports each Windows operating system until that operating system reaches end of life. We don’t recommend running versions of Windows that Microsoft no longer supports. geoSCOUT is not compatible with Linux, macOS or iOS, but will run on a macOS computer that emulates Windows. Individual workstations need the following specs to run geoSCOUT. Windows 7, 8, 8.1, or 10. These requirements are a guide, but due to the number of possible PC configurations, your situation may be unique. Always ensure your workstations are appropriate for your peripherals and operating environment. For example, 4K monitors may need significantly more video memory than is typical of on-board integrated video cards. If you have questions about workstation or network requirements, email us.